On Tuesday, I listed six benefits of writing and how writing is therapeutic. 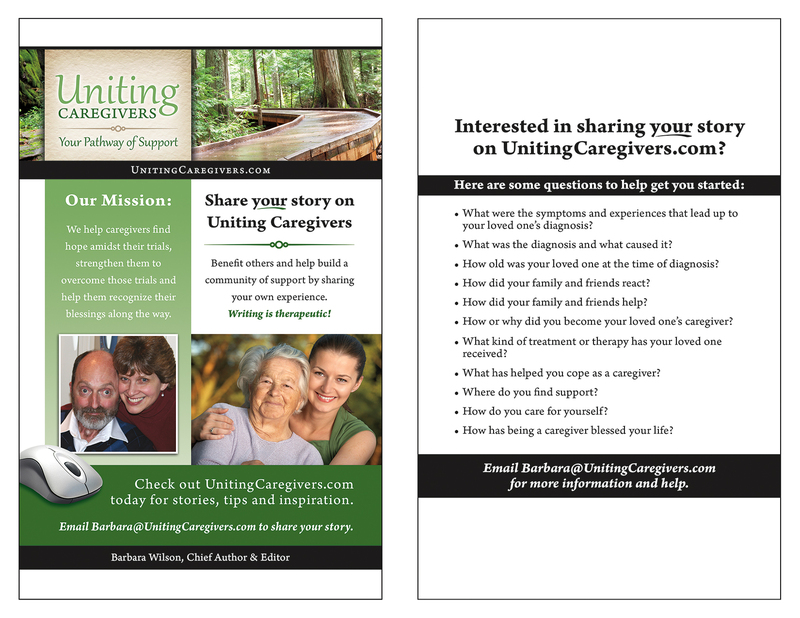 Now I’m inviting you to share your story on Uniting Caregivers. I hope you’ll give it some serious thought. Click flyer image to enlarge. The questions listed do not have to be answered. They are only suggestions to get you started. If you have questions or concerns please email Barbara@UnitingCaregivers.com. Nate and Cally Johnson were my first guest authors on October 27, 2013. Over the past nine months, their daughter, Evey, has made some remarkable improvements, along with some setbacks. I invited them to give us an update, which they so graciously accepted. The first two paragraphs are from their first article, Evey’s Story. On May 31, 2012 our lives dramatically changed for the better. Our daughter Evey, our fourth child, was born that day with an extremely rare genetic disorder called 17q21.31 micro-deletion syndrome. It is also known as Koolen-de Vries Syndrome. If there’s one lesson I have learned as a caregiver it is to expect the unexpected. There’s a fine line of balancing expectations with optimism and being realistic without being pessimistic. As I watch other caregivers who are further along in their journey, I always admire the grace they exude when navigating their own specific journey. Evey has had setbacks and major triumphs over these last twelve months. One of Evey’s major challenges is severe scoliosis. Because of this, she has two titanium rods placed on both sides of her spine. It required extensive surgery to put them in, and she needs them surgically adjusted and expanded every 6 months as she grows until she stops growing at the age of fourteen. At that time they fuse her spine and by then she will have had more than thirty spine surgeries, not including several other surgeries she will need along the way. Most people see this as such a daunting undertaking for a caregiver, but I’ve learned to appreciate the consistency and schedule. If only all of Evey’s life could be so well scheduled, without unexpected surprises. Because of Evey’s scoliosis, the doctors and therapists were not sure if she would ever crawl or walk. They’d never seen such a young patient with her complications walk or eat on their own. I’m happy to report that over the last 3 months, Evey has learned to eat by mouth, and is no longer dependent on her feeding tube. A few weeks after learning to eat, Evey started to bear weight and can now get herself into a standing position and she can take steps in her walker. She has completely shocked her team of doctors and therapists. She also completely shocked us, her parents, since we just hoped Evey would stay the happy little girl she is regardless of whether she could ever eat or walk on her own. We were so excited that she had a spurt of development and is turning into quite the independent two-year-old. Between these new developments, we have also had some surprising setbacks. We learned she is losing her hearing from some growths in her ears from repeated infections. Evey had to have ear surgeries in between spine surgeries, but we are no longer surprised by the unexpected and we had so much positive going on, we didn’t really have time to dwell on this new-found, disappointing discovery. Thankfully, with hearing aids, she’ll be able to obtain some hearing and we are now immersing the whole family in Sign Language to help Evey throughout her life. 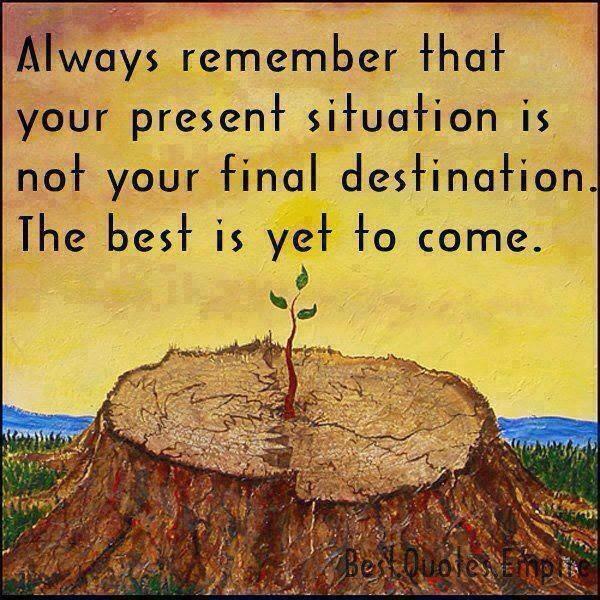 It has been such a growing period over these last few months adjusting to Evey’s triumphs and challenges. We are slowly learning, as caregivers, how to manage expectations and how to continue to be Evey’s biggest cheerleaders for her triumphs. We hope as time goes on we will continue to learn how to keep disappointment at bay and to always keep the expectations optimistic. Thankfully, we have met so many people along our journey with Evey who have shown us how to be as graceful as humanly possible in this adventure which is always unpredictable. Thank you, Cally, for sharing your story. You are a wonderful mom and caregiver to a very special daughter! Often it’s hard to fully appreciate what you have until it’s gone. When you miss it then you realize just how blessed you were. Last Sunday’s Story by Julie Brown, Caregiving Memories of My Grandmothers, was a great example of appreciation all way around. Julie was grateful for the opportunity to care for her grandmothers and they appreciate her for the care she gave. I was fortunate to know both of Julie’s grandmothers. They welcomed our family when we moved into the neighborhood. They were friendly, happy and the kind of people that always made you feel better just by being around them. Last summer when Mark was at the rehab center, Julie’s grandmother was in a room just a few doors down from Mark’s room. Since I was with Mark most of the time, we witnessed the sweet visits from Julie and her children. I was impressed and touched by her love and support and know her grandmother was also. At mealtime we often sat at the same table with Julie’s grandmother and she spoke often of her family and how grateful she was for them. 1) Sometimes your presence is all the help that’s needed. Julie recognized the importance of visiting her grandmother in the rehab center. Sometimes she would rub her feet, brush her hair and other times she just sat and held her grandmother’s hand. Giving support and encouragement in this way was all her grandmother needed. 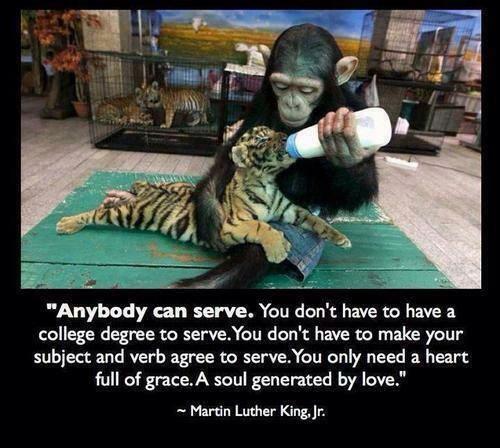 Nothing feels better than knowing you are loved and cared for. 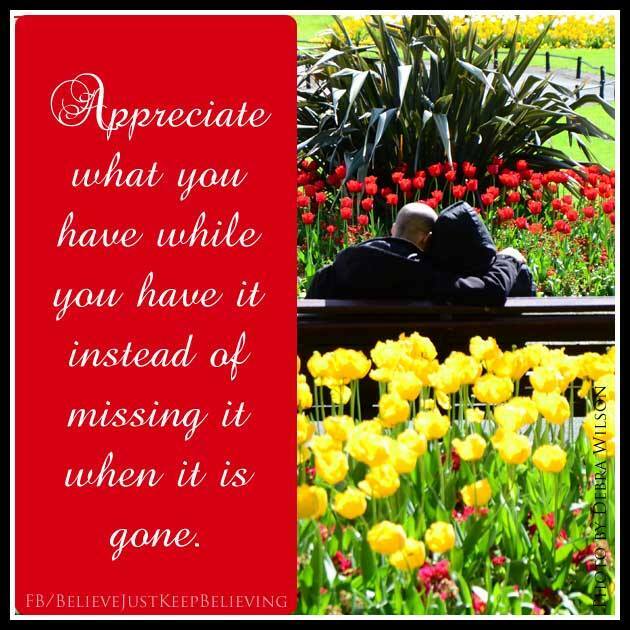 3) Appreciate the time you have. During the hard times, when Julie was tired or frustrated she would remind herself that her grandmother would not be here much longer and what an honor it was to take care of her. Most things are harder than we think they’re going to be and being a caregiver is no exception. I think it’s wonderful Julie stuck with it and recognized the blessings which came because of her service. The appreciation her grandmothers expressed to her and the feelings of gratitude she felt from her deceased grandpa brought pleasure and made her caregiving worthwhile. This is a great reminder for all of us—when someone is doing something nice for us—appreciation is the best pay.